Coming from an Indian family, you grow up doing certain things that you eventually realize other families may not do. For one, we take off our shoes when we enter a home. For a long time, I thought this was to keep the carpet clean, but, in fact, it’s a sign of respect. Another thing: we have big families and host large events, sometimes packing people in small spaces. Which brings me to our housewarming this past weekend. We learned how to fit about 130 people in less than 500 square feet of space in the kitchen and living room. Since settling into our house, we had been meaning to host a housewarming/prayer at our place for our church members. Saturday was the big day. Everyone sat cross-legged on the floor, crammed into every square inch of the kitchen and living room floors. The kitchen was lined with comforters and the living room with sheets. 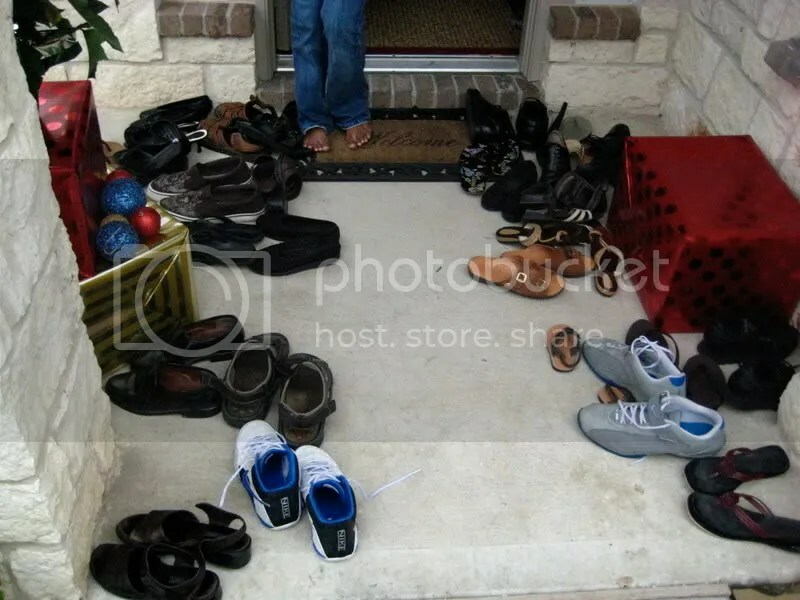 Hundreds of pairs of shoes lined the entryway outside our house. That’s how we roll! For about an hour, our pastor led a prayer meeting. We felt a lot of love from the folks that came out. Then, lunch commenced. 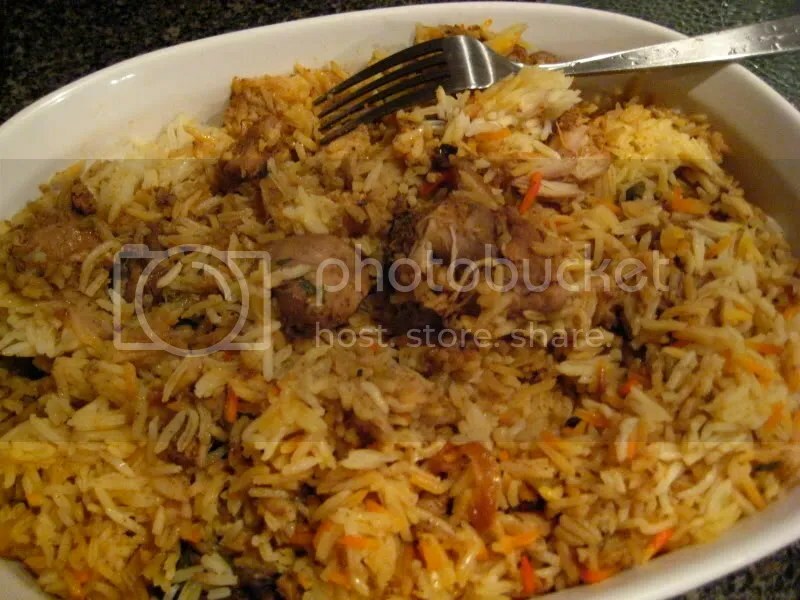 Chicken biryani from caterer Oasis, with fruits, veggies, pappadam and yogurt on the side and pizza for the little ones. Food and drinks were served on tables in the garage. We were armed with borrowed folding chairs and tables, 15 bottles of Sprite, eight gallons of water and 200 cups, plates, forks and spoons. The weather was perfect. Some ate outside at the mini-park across the street. Sajan’s uncle, aunts and cousins had traveled down from Dallas. They got to flip through our wedding album. Once the crowd began to disperse, some of our close friends came over. We feasted on leftover food, then put our noggins to work competing against each other in DVD games about Seinfeld and The Office. Miraculously, no stains made their way to the carpet. Sigh of relief! What was your housewarming like? Small or huge? Did you cater? Did you find unsightly stains? Any tips for future housewarming events? This entry was posted in A Tale of Two Homeowners, kerala, The Marriage Chronicles and tagged biryani, housewarming, kerala. Bookmark the permalink. HA! Its funny that you mentioned carpet stains. One uncle in a former church refused to have prayers in his new house once he got new carpet installed. Nice job with hosting a very chillaxing housewarming.